Introduction: Tobacco use is one of the major preventable causes of death and disability worldwide. The practice of law can be demanding and exceedingly stressful. Trends in tobacco use among young people are important to document because these findings will help inform the development of appropriate preventive intervention programs for youth. Aim: To assess prevalence of tobacco and associated risk factors among university law students in Indore city. Objective: To identify the strength of association related to tobacco consumption. Materials and Methods: A descriptive cross-sectional study was conducted among 278 law students in Indore city using convenient sampling technique. The data was collected using pre-tested close ended self-administered questionnaire. Frequency distribution analysis was performed. Bivariate analysis was done followed by logistic regression analysis. The level of significance for all the tests was set at P < 0.05. Results: The present study revealed that 32% of the study subjects consumed smoking tobacco as compared to 2.5% of smokeless tobacco. Nearly two-third of the law students consumed tobacco at public places 185 (66.5%) under the influence of friends. Only 18 (6.5%) study subjects tried to quit tobacco in the last 12 months whereas 65 (23.4%) of them never wanted to quit the habit of tobacco consumption. A bivariate analysis was performed to identify the risk factors related to tobacco consumption. It was found that male individuals (OR=2.04, P =0.004*) whose family members had the habit of tobacco consumption (OR=2.9, P =0.002*) were at a higher risk for consuming tobacco. The factors that became significant in bivariate analysis were then entered in logistic regression analysis [Enter method] to identify the strength of association. The individuals who had the habit of tobacco consumption among family members emerged as the strongest risk predictor leading to tobacco consumption amongst the students. Conclusion: The present study revealed that smoking form of tobacco consumption (cigarette- 32%) was more prevalent among the male study subjects under the influence of friends and with family members who had the habit of consuming tobacco at their place of residence. Tobacco use is one of the major preventable causes of death and disability worldwide. It has been recognized as a major public health problem faced by both developing and developed countries. Smoking of cigarette is an age-old practice in India. Evidences accumulating since early 1950s indicate that more than 25 diseases are now known or strongly suspected to be causally related to smoking. Tobacco use is an emerging pandemic marching forward relentlessly. Recent trends in tobacco use have focused public health attention on young adults (aged 18–24 years). In India, tobacco use among children and youth is quite high. The global youth tobacco survey 2009 reveals that the prevalence of the current use of tobacco among 13–15 years old is 19% among the males and 8.3% among the females. Tobacco use seems to be in transition during young adulthood as the experimental smoking begun during adolescence matures to established use. Physical activity, diet, and psychosocial aspects such as hygiene, stress, smoking, and alcohol usage play a vital role in sustaining healthiness and preventing illness. The practice of law can be demanding and exceedingly stressful. The stressful situations along with changing lifestyle increases alcohol and tobacco consumption thereby depriving an individual from healthy nutrition and also causing sleep disorders. Consumption of alcohol may cause stroke, high blood pressure, liver diseases, stroke, some types of cancer, and so forth. Alcohol usage and stress are interlinked; as the amount of stress increases, the usage of alcohol also increases. Source of stress for some lawyers is the adversarial nature of the profession itself. The World Health Organization attributes over four million deaths a year to tobacco. This figure is expected to rise to 10 million deaths a year by 2030, with 70% of these deaths occurring in developing countries. In India, tobacco kills 8–10 lakhs people each year and many of these deaths occur in people who are very young. It has been estimated that an average of 5½ min of life is lost for each cigarette smoked. Trends in tobacco use among young people are important to document because these findings would help inform the development of appropriate preventive intervention programs for youth. They also would help in making projections of future tobacco-related deaths more precise. These projections are based on the current patterns of tobacco use in adults which will change as the tobacco epidemic matures in countries such as India. Studies on tobacco habits among university law students are scarce with a focus on a specific group of the university student population. The prevalence of tobacco consumption reflects the magnitude of the problem and determining it is important since it provides a basis for the planning of public health actions. To assess prevalence of tobacco and associated risk factors among university law students in Indore city, Central India and to identify the risk factors and the strength of association related to tobacco consumption. The present study was conducted for a period of 5 months (August 2016 to December 2016) in the School of Law, Devi Ahilya Vishwavidyalaya in Indore City, Central India. Permission and ethical clearance were obtained from the Institutional review board of the School of Law, Devi Ahilya Vishwavidyalaya and Sri Aurobindo College of Dentistry, Indore, respectively. A structured questionnaire was developed to assess the prevalence of tobacco and associated risk factors among university law students in Indore city. For development of the questionnaire, an item pool was developed through review of literature of previous studies and also through subjective selection of items. Item pool was reviewed for its comprehensiveness, relevance, and clarity. All the items believed to be appropriate for the given topic were selected. The questionnaire was designed to have five parts: profile of the participant, place of residence, type of tobacco consumption, reasons for use/nonuse of tobacco products, and quitting habits. The questionnaire elicited information about the age, gender, field of study, year of study, and family history for oral cancer if any. The reliability testing of the questionnaire was carried out and calculated using Cronbach's alpha. The questionnaire was administered on 10 participants, and based on their responses, the Cronbach's alpha was calculated. It was found to be 0.859 for all the items which is suggestive that the Cronbach's alpha was within acceptable limits. The face and content validation were carried out in two phases. The first phase was performed with the help of two experts who had thorough knowledge of the publication process of scientific literature. Assess the relevance and completeness of the contents of the questionnaire. Items believed to be confusing and redundant were identified. In the second phase, validation was performed with a small group of participants. The questionnaire was first administered to this group and then interviewed. During face-to-face interviews, the participants indicated whether each item was clear or unclear. Further, the participants were queried at the end of the interviews regarding concepts or questions that were deemed missing, irrelevant, and/or confusing. These queries aimed to identify unclear or redundant items and to assess professionals' and respondents' reactions to the questionnaire format and response usage. The questionnaire was then finalized considering the inputs and feedbacks from the experts and respondents. Study population consisted of 1st, 2nd, 3rd, 4th, and 5th year students of law school, Indore. The questionnaire was distributed to the students personally. The objective was explained to the participants and written informed consent was obtained. It took 5–10 min to complete the questionnaire. The investigator was always present to clarify the doubts of the respondent. A structured questionnaire was developed consisting of questions to assess the prevalence of tobacco and associated risk factors among university law students in Indore city. Participants providing informed written consent. Participants who were psychosocially compromised and were not willing to participate in the study. Completed questionnaires were coded and statistical analysis was done using Statistical Package for Social Sciences (IBM SPSS Statistics for Windows, Version 20.0. Armonk, NY: IBM Corp). Frequency distribution analysis was performed. Bivariate analysis was done followed by logistic regression analysis to identify the risk factors related to consumption of tobacco. The level of significance for all the tests was set at P < 0.05. The study sample comprised of 278 1st, 2nd, 3rd, 4th, and 5th year students from law school. Among the study participants, 125 (45.0%) were males and 153 (55.0%) were females. A total of 60 students from 1st, 2nd, 3rd, and 4th year while 38 students from 5th year participated in the present study. A total of 261 (93.9%) of the students were unmarried. 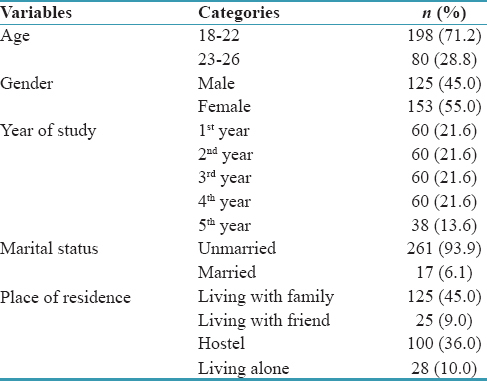 Majority of the study participants, i.e., 125 (45%) were living with family [Table 1]. Nearly two-third (67.3%) law students never consumed tobacco or alcohol (63.7%). About 32.4% of family members of the study participants had the habit of tobacco consumption. Nearly 32% of the study participants consumed smoking tobacco as compared to 2.5% of smokeless tobacco [Table 2]. Smoking cigarette 69 (24.8%) was common among the law students followed by hookah 16 (5.8%). Smokeless tobacco consumption was less prevalent among the study participants [Table 3]. In the present study, 63 (22.7%) of the study participants started tobacco consumption at a very early age (14–20 years). Nearly two-third of the law students consumed tobacco at public places 185 (66.5%), under the influence of friends 185 (66.5%), and very few of them consumed tobacco just for fun/pleasure 37 (13.3%). Only 18 (6.5%) study participants tried to quit tobacco in the last 12 months, but 65 (23.4%) of them never wanted to quit the habit of tobacco consumption [Table 4]. A bivariate analysis was performed to identify the risk factors related to tobacco consumption. It was found that male individuals (odds ratio [OR] = 2.04, P = 0.004*) whose family members had the habit of tobacco consumption (OR = 2.9, P = 0.002*) were at a higher risk for consuming tobacco [Table 5]. The factors that became significant in bivariate analysis were then entered in logistic regression analysis to identify the strength of association. 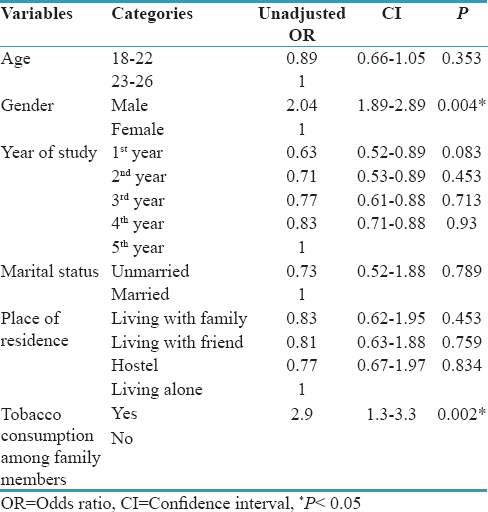 The male individuals who had the habit of tobacco consumption among family members emerged as the strongest risk predictor leading to tobacco consumption among the students [Table 6]. Tobacco is a major public health problem. Unfortunately, tobacco use is on the rise in several developing countries including India. The burden of tobacco-associated diseases such as the chronic obstructive pulmonary disease (COPD) in India is as or even more serious than in several other countries. COPD is the fourth leading cause of death and an ever-increasing worldwide public health problem with its epidemiological, clinical, social, and economic impact increasing in the near future making it the third most important cause of death in the next 10–15 years. The significance of prevalence data on tobacco use in the youth is important both to assess tobacco as a risk factor and to institute control measures for prevention of those diseases. The present study assessed the prevalence and risk factors for tobacco consumption among law students of Devi Ahilya Vishwavidyalaya, Indore. The present study shows a prevalence of 43 (15.5%) for ever users and 48 (17.3%) for current tobacco users. Smoking appeared to be the predominant form of tobacco use for both ever users and current users. 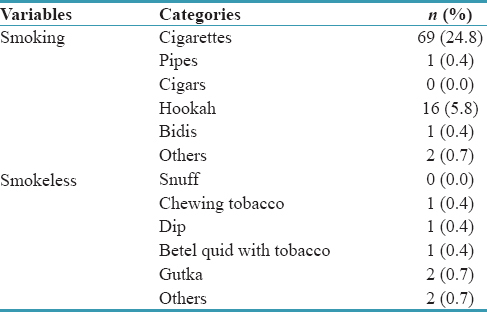 Among tobacco users, most of the study participants were smokers in which 69 (24.8%) were cigarette smokers followed by 16 (5.8%) of hookah smokers. Two (0.7%) consumed gutka and other smokeless tobacco. The observations of Nichter et al. of college students in urban areas of Karnataka also confirmed a higher use of smoking (46%) compared with smokeless tobacco (29.7%). Moreover, they found that school culture might be an important factor in influencing the pattern of tobacco use, with students from professional educational institutes (i.e., medicine, law, and engineering) being more likely to smoke cigarettes compared with students from government, Kannada-medium schools who were more likely to use smokeless tobacco products, and vice versa. Individuals who spent more time each day socializing with friends (66.5%) were more likely to be smokers (24.8%), presumably because they had more opportunity to smoke at a public place (66.5%). Smoking was also associated with drinking alcohol (36.3%), which also occurs in a social context among college students. The findings are consistent with previous studies demonstrating that college smoking is associated with alcohol use and a lifestyle that values socializing and parties. It is curious that smoking was inversely associated with intention to quit smoking (23.4%) and with having made a recent quit attempt in the last 12 months (26.6%). College students generally believe that they will quit smoking some time after graduation. A qualitative study suggested that smokers may not perceive themselves as “smokers” who need to quit or are at risk for becoming nicotine-dependent or regular smokers. 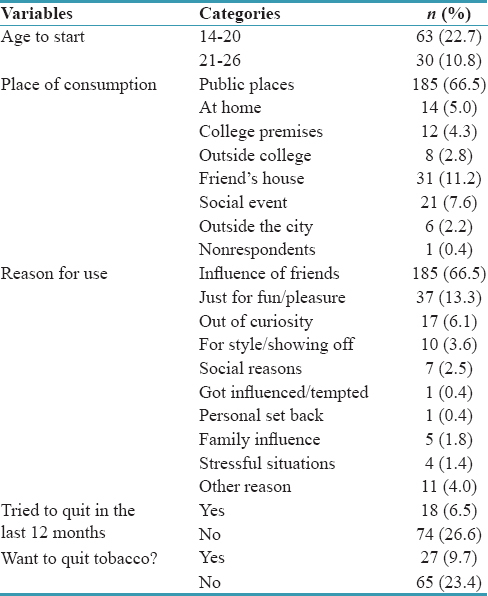 Akin to our findings, a study from the urban areas of Dakshina Kannada district of Karnataka found that curiosity (52%), encouragement from friends (40%), and appearing “in style”(18%) were reasons given frequently to start smoking. Similarly, a study from Delhi reported “enjoyment” and “curiosity” as major factors that influence adolescents to start using tobacco. Shah et al. conducted a cross-sectional study among 2193 final year students of 10 colleges. The study revealed that the overall prevalence of tobacco consumption was higher among nonmedical students compared to medical students, the difference was statistically significant. The prevalence rate of tobacco consumption among male medical students was 17.6%, but certain studies showed the prevalence of 2.7%., The prevalence rate of tobacco consumption among females was zero which might be due to our social structure in which female smoking is not acceptable and is correlated with morality. The study observed that 34.2% of the students started the habit for the sake of adventure followed by mental tension (25.4%), peer pressure (15.8%), and tobacco advertisement (5.3%). The observations of Baby Mathews et al. are also consistent with the findings of our study. The study reported smoking to be the predominant form of tobacco use. Among tobacco users, all were smokers in which 96.7% were cigarette smokers and 3.3% used bidi and no one reported smokeless tobacco use. Barani and Sabapathy in a study conducted in Coimbatore, Tamil Nadu, to study the attitudes and health behavior of lawyers concluded that higher proportions of male lawyers consumed tobacco daily, and none of the female lawyers reported themselves as smokers. This shows that there is relationship between gender and tobacco usage, as male lawyers were found to smoke more than women lawyers. Our study clearly indicates that male individuals (OR = 2.04, P = 0.004*) whose family members had the habit of tobacco consumption (OR = 2.9, P = 0.002*) were at a higher risk for consuming tobacco. The limitation of this study is the relatively small sample size and self-reported data on the prevalence of tobacco use, which can be biased. Appropriate interventions are needed to reduce tobacco use among students in India. We suggest that larger, systematic studies are conducted to better understand tobacco use and its associated factors among the law students. Such interventions should raise awareness of the social and economic implications of tobacco use and equip students to overcome influence, while at the same time providing help to quit tobacco use. Sinha DN, Gupta PC, Pednekar M. Tobacco use among students in Bihar (India). Indian J Public Health 2004;48:111-7. Baby M, Ramamurthy PH, Bennadi D, Konakeri VS. Prevalence and determinants of tobacco use among pre-university college students, Bangalore, India. J Young Pharm 2016;8:118-21. Chatterjee T, Haldar D, Mallik S, Sarkar GN, Das S, Lahiri SK, et al. A study on habits of tobacco use among medical and non-medical students of Kolkata. Lung India 2011;28:5-10. Moran S, Wechsler H, Rigotti NA. Social smoking among US college students. Pediatrics 2004;114:1028-34. Bhojani UM, Chander SJ, Devadasan N. Tobacco use and related factors among pre-university students in a college in Bangalore, India. Natl Med J India 2009;22:294-7. Global Health Observatory Data (GHO). Available from: http://www.who.int/gho/tobacco/use/en/. [Last accessed on 2016 Nov 11]. Barani G, Sabapathy P. Attitudes and health behavior of lawyers in Coimbatore, Tamil Nadu. ScientificWorldJournal 2015;2015:616719. Podstawski R, Gornik K, Gizinska R. Habits and attitudes of first year students at Warmia and Mazury University, Poland regarding healthy lifestyle. Educ Med J 2013;5:64-76. Psychologytodaycom, Psychology Today; 2011, Available from: http://www.psychologytoday.com/blog/therapy-matters/201105/the-depressed-lawyer. [Last accessed on 2016 Nov 11]. Global Youth Tabacco Survey Collaborative Group. Tobacco use among youth: A cross country comparison. Tob Control 2002;11:252-70. Mathur C, Stigler MH, Perry CL, Arora M, Reddy KS. Differences in prevalence of tobacco use among Indian urban youth: The role of socioeconomic status. Nicotine Tob Res 2008;10:109-16. Khader YS, Alsadi AA. 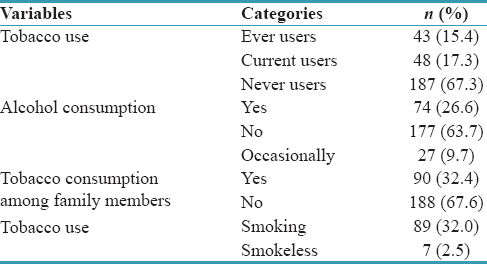 Smoking habits among university students in Jordan: Prevalence and associated factors. East Mediterr Health J 2008;14:897-904. Hindu K, Vanitha RN, Hari PB, Kannan G, Thennarasu P. Impact of severity of the disease on cost of illness and quality of life of patients with chronic obstructive pulmonary disease. JYP 2015;7:106-12. Shah VN, Verma PB, Tripathi CB. Knowledge, attitude and practice regarding tobacco consumption among the college students of Bhavnagar city (Gujarat). Indian J Community Med 2005;30:1-2. Tessier JF, Fréour P, Belougne D, Crofton J. Smoking habits and attitudes of medical students towards smoking and antismoking campaigns in nine Asian countries. The Tobacco and Health Committee of the International Union against Tuberculosis and Lung Diseases. Int J Epidemiol 1992;21:298-304.